According to Conflict Monitoring Center’s Monthly Security Report (MSR) one month of ceasefire between TTP and government have seen remarkable reduction is militant attacks in the country especially in FATA and KP province. Reduction in militant attacks is observed in all provinces except Punjab where already militant attacks remain lowest in the country. Overall 41 percent decline in militant attacks was observed during the month. From 1st of March to 31st of March 2014, militants carried out 115 violent activities in which 132 people died and 246 injured. 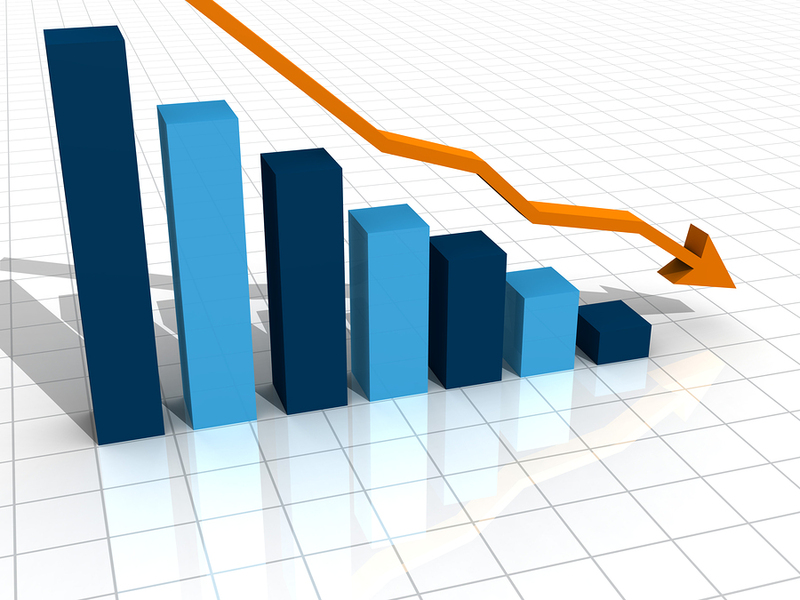 Almost fifty percent decline in fatalities and casualties was also observed during the period. 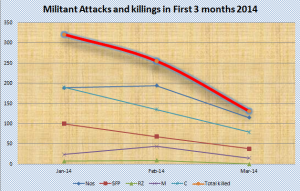 Number of suicide attacks also declined as only two suicide attacks were recorded by the CMC during compare to six each in January and February of the current year. During the ceasefire, security forces shifted their focus on intelligence based operation in mainland Pakistan. Security forces’ actions against militants and insurgents saw increase in Balochistan and Sindh while they declined in rest of the county. 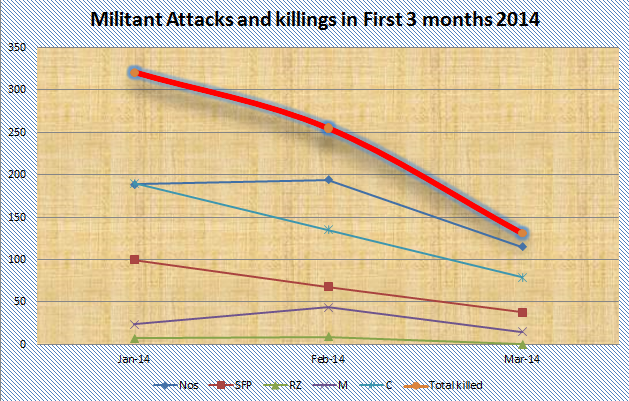 Number of militants killed in security forces’ actions dropped to just 15 compared to 150 in February. Number of arrests of suspected militants saw an unprecedented increase during the month as 1078 suspected militants were arrested compared to 143 in previous month. According to stats released by the Conflict Monitoring Center during March 2014, total 204 incidents related to anti-state violence and counter actions by security force were reported in which 149 people were killed, 246 others were injured while 1078 suspected militants have been arrested. Out of these 204 incidents, 115 were militant activities in which 132 people were killed including 38 security forces personnel (SFPs), 15 militants and 79 civilians while 246 people were injured including 39 SFPs, three Razakars, two militants and 202 civilians. Militants also kidnapped 19 persons during the month. Total number of incidents has come down from 292 in the previous month to 204 in this month. Number of fatalities has also witnessed a sharp decline from 407 to 149 as compared to previous month. Similarly, number of injured has also come down to 256 as compared to 516 last month. The number of arrests by the security forces has gone up from 143 in last month to 1078 suspected militants in March. Balochistan recorded the highest number of incidents indicating a heat-up in the province as out of total 115 militant activities of the month, 47 were reported from Balochistan. However, if compared to previous month a visible reduction is observed when militants had carried out 72 attacks in the province. Balochistan has been facing three types of militant movements. Nationalist rebellion, sectarian violence and Al-Qaeda-TTP driven militancy. Nationalist rebels did not cease their attacks during the month however a decline is observed in sectarian and Al-Qaeda driven militant attacks during the month. In 47 militant activities in Balochistan, 45 people were killed including seven SFPs, six militants and 32 civilians while 90 others were injured including 19 SFPs and 71 civilians. Militants also kidnapped five people in Balochistan. Militants were involved in 36 incidents in Khyber Pakhtunkhwa (KP), 19 in FATA, five in Punjab and seven in Sindh while one militant activity was witnessed in Islamabad Capital Territory (ICT).. KP was comparatively another hot area where 36 militant’ activities caused death to 32 people including 10 SFPs, five militants and 17 civilians while 89 others got wounded including 13 SFPS, two militants, and 74 civilians. Ten people were kidnapped in various parts of KP by militants. Nevertheless, if compared with previous month a remarkable improvement in security situation is observed during first month of ceasefire. A 40 percent decline in militant attacks and three times decline in fatalities is observed in the province. In FATA, there were 19 militant activities that resulted into death of 32 people including 15 SFPs, four militants and 14 civilians while 30 others were injured including six SFPS, three Razakars and 21 civilians. Four people were kidnapped by the militants. In five militant activities in Punjab, three persons were killed including two SFPs and one civilian while two other civilians were injured. Sindh witnessed seven violent militant activities in which six people were killed including two SFPs and four civilians while three were injured including one security forces personnel and two civilians. No militant activity was reported from Azad Jammu & Kashmir (AJK) and Gilgit-Baltistan (GB). Security forces carried out 89 actions during the month in which 17 people were killed (all militants) and 10 others were injured including one SFP, six militants and three civilians. Security forces also arrested 1078 suspected militants. Security forces actions increased in Balochistan and Sindh while declined in FATA, KP and Punjab. Highest number of security forces action were recorded in Sindh where 31 operations were carried out by the security forces in which three militants were killed while 515 suspected militants were arrested. Previous month, CMC had recorded 16 security forces’ actions in Sindh in which two militants were killed and 28 were arrested. 18 times increase in arrests shows focus of security forces actions in the province. This is the highest number of arrests in any province or administrative region during the month. Sindh has been facing ever-increasing threats from different types of militant groups including TTP, Al-Qaeda, and militant groups of some political parties. In 20 security forces actions in KP, one militant was killed and two civilians were injured while 362 suspected militants were arrested. Almost fifty percent decline in security forces actions have been observed in KP however 15 times increase in number of arrests of suspected militant expresses the focus of the security forces itself. 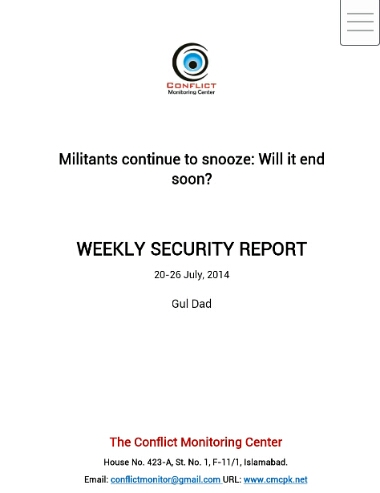 In February 2014, security forces had conducted 38 actions against militants and arrested 24 suspects. In Balochistan, security forces carried out 20 operations in which seven militants were killed and one was injured while 130 suspected militants were arrested. According to CMC’s tally, almost fifty percent increase in security forces actions and almost ten times increase in number of arrests is observed in the province. During March 2014, nine security forces actions in FATA were recorded in which six people were killed and seven others injured including six militants and one civilian while 25 suspected militants were arrested. Security forces actions in FATA saw more than fifty percent decline during the month of ceasefire while 18 times decline in militant fatalities in security forces actions tells the restraint exhibited by the forces during the first month of ceasefire. Number of arrests in FATA also declined from 44 to 25 in during the month. In Punjab, security forces carried out six operations to arrested 31 suspected militants. No death or injury was reported in these six operations. Almost fifty percent decline in security forces’ actions was also observed in Punjab as during February 11 actions were carried out against the suspected militants. Security forces also conducted three operations in ICT and arrested 13 suspected militants. No security forces action was witnessed in AJK and GB.